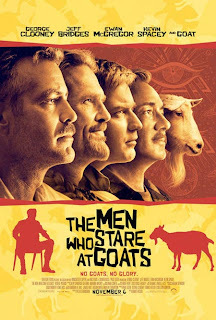 For a while into this movie, I thought The Men Who Stare at Goats was going to be a stone-cold classic. The acting and actors were especially snappy, tight, and hilarious. George Clooney is a perfect mix of his whiskery and slick characters ala Three Kings and Ocean's Eleven. Ewan McGregor is a young "Jedi warrior" journalist on a mission to Iraq to prove to his ex-girlfriend that he's a real man. Jeff Bridges follows a strong line of movie-character gurus like Tom Cruise in Magnolia and Mike Myers in The Love Guru. Kevin Spacey is the only big star here who doesn't offer much. An excellent McGregor finds his way into the middle of the war by sneaking into Iraq with Clooney, who has served for years under the New Age troop leader Bridges (who invented the slogan "Be all that you can be"). The soldiers in this troop learn the spiritual arts of mind control, and Clooney's powers are so strong that, at one point, he kills a goat just by out-staring it. Although the three main stars keep this movie captivating throughout, and the dialog and social commentary on the true-life adventures of the U.S. military's explorations into parapsychology is truly fascinating and wacky, the script becomes a little tiring. By the end, it seems a little too silly, even by my low standards in this category.